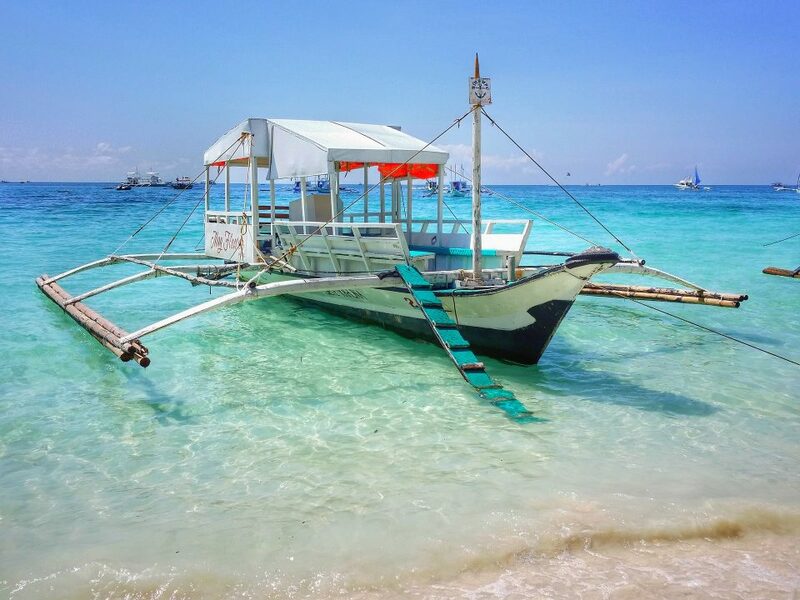 The Philippines, the third largest English-speaking country in the world, has much to offer tourists, whether they wish to see natural wonders, historical landmarks, arts and crafts, or enjoy the culture, entertainment and traditions, or simply shop. It has one of the world’s longest coastlines, and more than 7,000 islands, where one can find beautiful beaches and do many water sports activities. This country’s varied landscape offers breathtaking natural sights — lush forests, tropical islands, white sand beaches, lakes, rivers, mountains – while the cities offer numerous museums and art galleries that showcase its rich history and culture. Its history combines Asian, European, and American influences. Before its colonization in the early 1500s by the Spanish, the Filipinos traded with the Chinese and the Japanese. In 1898, when the Philippines was still part of the Spanish East Indies, Spain ceded it to the United States. After a period of innovation, but also great political struggles, the United States formally recognized the Philippines’ independence in 1946. Filipinos are a fun-loving, warm, hospitable and strong people, with an indomitable spirit. They are mainly of Malay descent, an ethnic group that predominantly inhabits the Malay Peninsula, eastern Sumatra, coastal Borneo, and the smaller islands of the region. However, Chinese, American, Spanish and Arab blood is commonly found in the population that counts over 76 million. This interesting mix can be seen not only in the attractive appearance of the Filipinos, but also in their renowned spirit of kinship, their close family ties, their religiousness and their hospitality. Although Filipino is the national language, and English is the second language in the country, the Philippines has more than 100 dialects. It is a country of predominantly Christians, with a large majority of Roman Catholics, and there are many other religious denominations. When visiting the Philippines, besides enjoying its numerous beach locations where there is the highest density of coral species in the world, it is wise to include in the itinerary the following sites: the UNESCO World Heritage Site Banaue Rice Terraces; Taal Volcano in Batangas, the smallest active volcano in the world; the unique land formation, Chocolate Hills, in Bohol; the UNESCO World Heritage Site Tubbataha Reef, and Coron, the location wreck diving sites, in Palawan. Shopping can be an experience both in bargain and variety as there is everything, from designer western brands to fresh produce to native delicacies and fine fabrics. One can experience the Filipino culture all year round, by participating in the many street parties and processions in honour of patron saints, and harvest festivals where there are dancers, paper-mache effigies, carnivals, fairs and costumed parades. Adobo: made with meat or seafood or vegetables, or a combination, cooked with vinegar, salt, garlic, pepper, soy sauce and other spices. It varies from region to region, depending on the availability of ingredients and the way the recipe was traditionally handed down from generation to generation. Lechon: whole pig spit-roasted over coals, served with liver sauce, and the stomach is stuffed with star anise, pepper, spring onions, laurel leaves and lemongrass, thus the lechon. Pakbet or pinakbet: a vegetable dish of okra, eggplant, bitter gourd, squash, tomatoes and bagoong, which is a shrimp or fish paste. 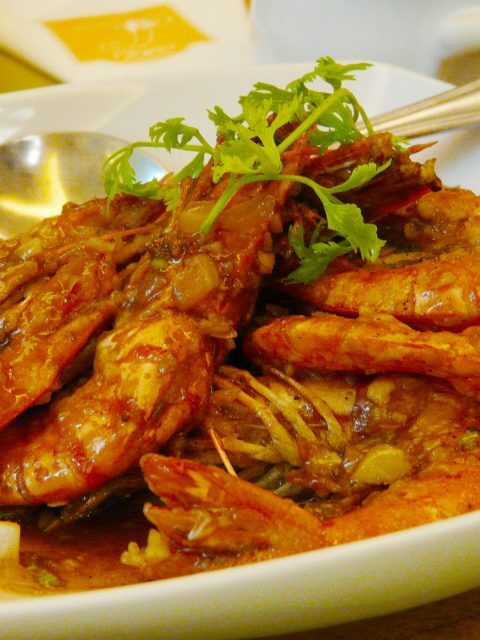 It is cooked in a clay pot called “Palayok” and an anchovy sauce, called bagoong isda, is used to add flavour. Dinengdeng or inabraw: a vegetable dish with fried or grilled fish, usually bangus (milk fish) or tilapia. Kare-kare: meat and oxtail and vegetables stew, cooked in a peanut sauce, also made with seafoood. The delicious sauce is made from ground toasted rice and crushed peanuts, banana blossom, eggplants and string beans. It is eaten with steamed rice and bagoong (shrimp paste). 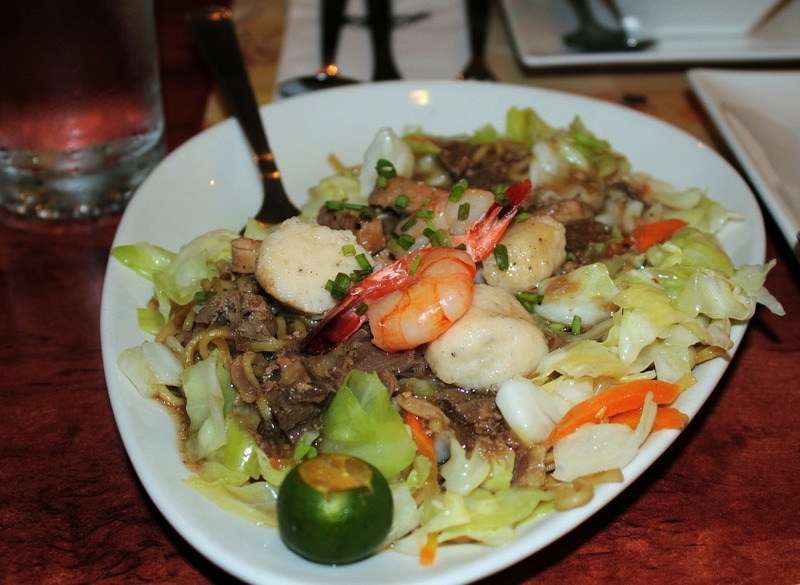 Sinigang: a stew of fish, prawns, pork or beef soured by fruits like tamarind, kamias or tomatoes. 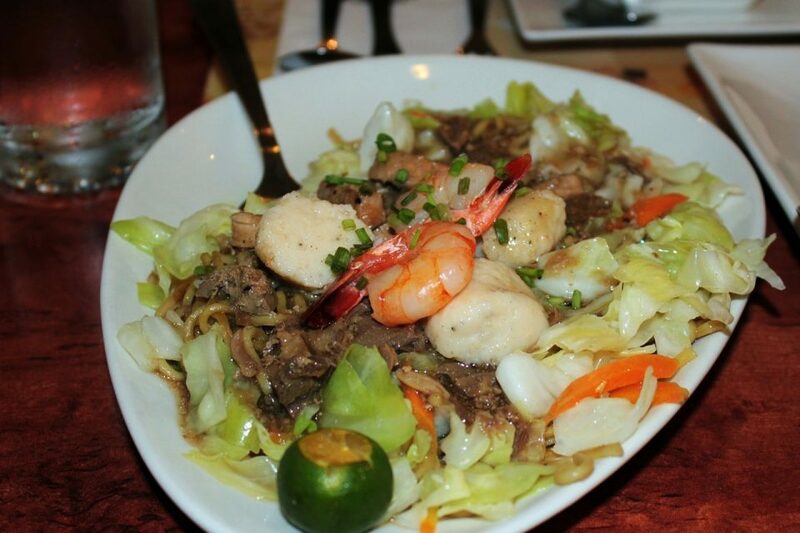 It is often accompanied by vegetables like kangkong, string beans, taro, and rice. Dinuguan: meat and pork innards and blood stew, spicy and dark, eaten with steamed rice or puto, rice cakes. 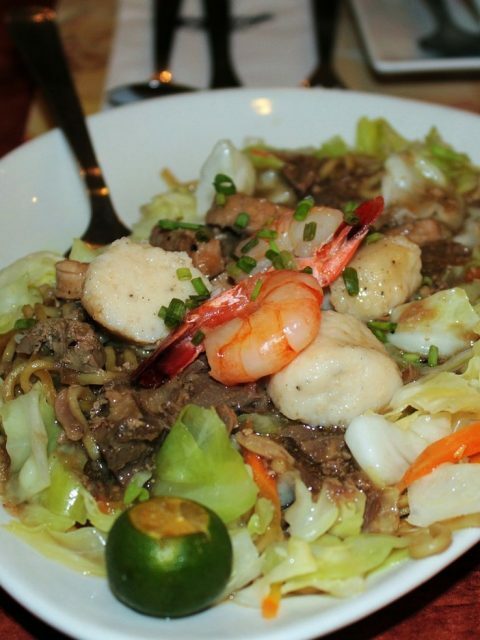 Pancit: noodles garnished with carrots, chayote and meat, served with a rich sauce made from shrimp broth, pork, hard boiled eggs, shrimps, chicharron (pork rinds), and sometimes oysters and squid. Ensaymada: a sweet pastry cheesebread, topped with sugar and cheese, often served with thick hot chocolate. Pandesal or Bread of Salt: probably the most popular bread made in the Philippines, and a favourite breakfast food. They are small oval buns, with a brownish crust, that conceal a soft and fluffy inside, and can be eaten plain or filled. Chicken inasal: grilled chicken marinated in lemongrass, calamansi, salt, pepper and garlic and brushed with achuete (annatto seeds) oil. 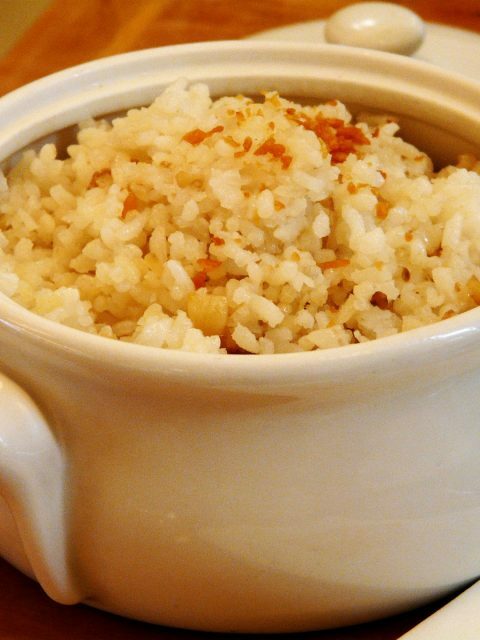 It is eaten with garlic rice, with some of the oil used for the marinating poured over it. Bulalo: a hot soup made with beef that is boiled for hours. Arroz Caldo: a thick chicken rice porridge cooked with ginger and sometimes garnished with a hard-boiled egg, toasted garlic and green onions. Fish tinola: a simple sour broth flavored with onions, tomatoes and sambag (tamarind), cooked over coco-lumber firewood for hours. Longaniza: pork sausage, usually eaten for breakfast with garlic rice, fried egg and a dipping sauce of vinegar. Sinanglay: fresh tilapia that is first stuffed with tomatoes and onions, then simmered in coconut milk and wrapped in pechay leaves, which help keep the fish together and add a peppery taste. 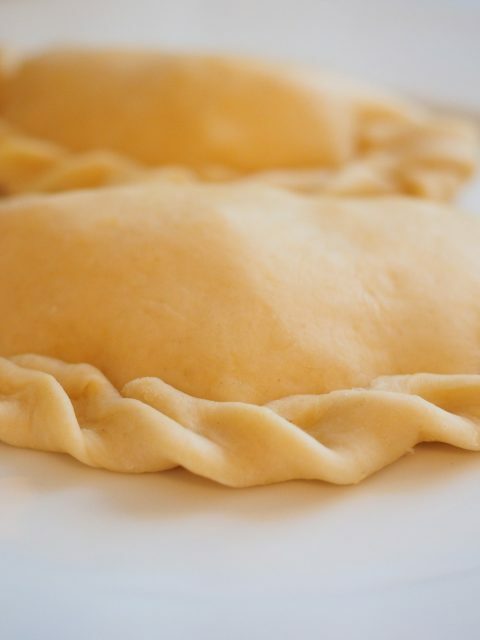 Empanada de kaliskis: a traditional family heirloom dish made with meat, usually chicken, wrapped like a pie with a flaky, croissant-like pastry then deep fried. Ilocos empanada: grated unripe papaya or bean sprouts, egg and loganiza (pork sausage) are stuffed in the empanada and deep fried, accompanied with a spicy vinegar sauce. Camaro rebosado: shrimp coated in egg and flour batter and deep fried, then served with a tomato-based sweet and sour sauce. Bibingka: rice cakes made by soaking the rice overnight, grinding it with a mortar stone and mixing in coconut milk and sugar. The batter is poured into clay pots with banana leaves, and cooked with coals on top and underneath. It’s garnished with salted eggs, cheese, butter, sugar and grated coconut. Champorado: a hot rich chocolate rice porridge usually eaten for breakfast. Halo-halo: a popular dessert served in a tall glass or bowl, made with finely shaved ice, a generous serving of leche flan, gulaman, banana, kaong, beans and garbanzos, milk and a scoop of ube (sweet potato) ice cream. Le Filippine, il terzo paese al mondo dove l’inglese è la seconda lingua, ha molto da offrire ai turisti che vogliono vedere meraviglie naturali, monumenti storici, arte, artigianato, o gustarsi la cultura locale, l’intrattenimento e le tradizioni, o che vogliono semplicemente fare shopping. Ha una delle costiere più lunghe al mondo, con più di 7,000 isole, dove ci sono bellissime spiagge per fare tanti sport acquatici. Il paesaggio variegato offre viste naturali mozzafiato – foreste rigogliose, isole tropicali, spiagge con sabbia bianca, laghi, fiumi, montagne – mentre le città offrono numerosi musei e gallerie d’arte che mostrano la ricca storia e cultura del paese. La sua storia è ricca di influenze asiatiche, europee ed americane. Prima della colonizazzione da parte degli spagnoli nei primi del 1500, il popolo filippino commerciava con i cinesi e giapponesi. Nel 1898, quando le Filippine facevano ancora parte delle Indie Orientali Spagnole, venne ceduta dagli spagnoli agli Stati Uniti. Dopo un periodo di innovazione, ma anche di grandi battaglie politiche, gli Stati Uniti formalmente riconobbero l’indipendenza delle Filippine nel 1946. Il popolo Filippino ama il divertimento, è cordiale, ospitale e forte, con uno spirito indomito. E’ di origini malesi, un gruppo etnico che vive principalmente nella Penisola Malese, Sumatra Orientale, la costa del Borneo, e le piccole isole della regione. Tuttavia, nella popolazione che conta più di 76 milioni di abitanti, è facile trovare persone di sangue cinese, americano, spagnolo e arabo. Questo mix interessante si può notare non solo nel piacevole aspetto dei filippini, ma anche nel loro rinomato spirito di fratellanza, l’amore per la famiglia, la religiosità e l’ospitalità. Quando si organizza un viaggio nelle Filippine, oltre a godersi le numerose zone di mare dove c’è la più alta densità di coralli al mondo, è una buona idea inserire nell’itinerario quanto segue: UNESCO World Heritage Site Banaue Rice Terraces; Taal Volcano, Batangas, il più piccolo vulcano attivo al mondo; la particolare formazione chiamata Chocolate Hills, Bohol; UNESCO World Heritage Site Tubbataha Reef, e Coron, il luogo delle immersioni per vedere relitti sommersi, Palawan. Lo shopping può essere una bella esperienza, sia per come si fanno buoni affari che per la varietà perchè ci si può trovare di tutto, dagli abiti occidentali firmati ai prodotti freschi alle specialità locali e le stoffe pregiate. Sebbene il filippino sia la lingua nazionale, e l’inglese la seconda lingua parlata nel paese, esistono più di 100 dialetti nel territorio. E’ un paese prevalentemente Cristiano, con una grande maggioranza di Cattolici, e ci sono molte altre denominazioni religiose. Si può ammirare la cultura filippina tutto l’anno, partecipando alle tante feste di piazza e le processioni in onore dei santi patroni, e alle sagre dove si vedono danzatori, pupazzi di cartapesta, giostre, fiere e parate in costume. Adobo: fatto con carne o frutti di mare oppure verdure, o una combinazione, cucinato con aceto, sale, aglio, pepe, salsa di soia e altre spezie. Varia da regione a regione in base alla disponibilità degli ingredienti e il modo in cui la ricetta viene tramandata di generazione in generazione. Lechon: maiale cotto allo spiedo su carbone ardente, servito con salsa di fegato, e lo stomaco viene farcito con anice stellate, pepe, cipolline, foglie di alloro e citronella, e viene chiamato lechon. Pakbet o pinakbet: un piatto a base di okra, melanzane, zucca amara, zucca, pomodori e bagoong, una pasta di gamberi o pesce. Viene cotto in una pentola di creta chiamata “Palayok” e si aggiunge una salsa di acciughe chiamata bagoong isda per dare più sapore. Dinengdeng o inabraw: un piatto di verdure con pesce fritto o grigliato, solitamente il bangus o la tilapia. Kare-kare: stufato di carne e coda di bue e verdure, cotto in una salsa di arachidi, fatto anche con frutti di mare. La deliziosa salsa è fatta con riso tostato e macinato, e arachidi tritate, fiori di banana, melanzane e fagiolini, accompagnato con riso al vapore e bagoong (pasta di gamberi). Sinigang: uno stufato di pesce, scampi, maiale o manzo inacidito con frutti come tamarindo, kamias o pomodori. E’ spesso accompagnato da verdure come kangkong, fagiolini, taro e riso. Dinuguan: uno stufato di carne, interiora e sangue di maiale, scuro e speziato, consumato con riso al vapore o puto, tortine di riso. Pancit: tagliolini con carote, chayote e carne, servito con una ricca salsa fatta con brodo di gamberi, maiale, uova sode, gamberi, chicharron (ciccioli di maiale) e a volte ostriche e calamari. Ensaymada: piccoli pani dolci, molto soffici e burrosi, di solito serviti con pezzettini di formaggio e zucchero sopra, solitamente accompagnato ad un denso cioccolato caldo. Pandesal: probabilmente il pane più conosciuto nelle Filippine, molto usato per la colazione. La crosta nasconde un interno soffice, e può essere mangiato semplice o farcito. Chicken inasal: pollo grigliato, marinato nella citronella, con calamansi, sale, pepe e aglio, e spennellato con olio di achuete (semi di annatto). E’ mangiato con riso all’aglio, con qualche goccia di olio della marinatura. Bulalo: un brodo di manzo che viene bollito per ore.
Arroz Caldo: un denso porridge di pollo e riso cotto con zenzero e a volte accompagnato con uova sode, aglio tostato e cipolle verdi. Fish tinola: un semplice brodo agro fatto con cipolle, pomodori e tamarindo, cotto su legna di cocco per ore.
Longaniza: salsiccia di maiale, solitamente mangiata a colazione con riso all’aglio, uova fritte e una salsa all’aceto. Sinanglay: tilapia fresca ripiena di pomodori e cipolle, poi cotta a fuoco lento nel latte di cocco e avvolta in foglie di pechay, che tengono insieme il pesce e danno un sapore pepato. Empanada de kaliskis: un piatto tradizionale che viene tramandato di generazione in generazione in base al gusto della famiglia, fatto con carne, di solito pollo, avvolto in una pasta frolla tipo croissant, e fritto in abbondante olio. Ilocos empanada: papaya acerba grattugiata oppure germogli di fagiolo, uova e loganiza dentro le empanada e fritti in abbondante olio, accompagnati con salsa speziata all’aceto. Camaro rebosado: gamberi ripassati nell’uovo e farina poi fritti, serviti con una salsa agrodolce al pomodoro. Bibingka: tortine di riso fatte mettendo il riso in ammollo per tutta la notte, poi macinato con un mortaio e mischiato al latte di cocco e zucchero. L’impasto è versato in pentole di creta con foglie di banana, cotto con carbone ardente sotto e sopra. Come contorno uova salate, formaggio, burro, zucchero e cocco grattugiato. Champorado: un porridge di riso al cioccolato, ricco e caldo di solito consumato a colazione. Halo-halo: un dessert molto rinomato servito in bicchieri alti, oppure ciotole, fatto con granite, una porzione abbondante di leche flan, poi gulaman, banana, kaong, ceci, latte e gelato di ube (patata dolce).